Stephen Hawking’s book A Brief History of Time was published in 1988 and by 2007 had sold over 10 million copies. It was the brilliant physicist’s attempt to tackle such weighty ideas as the notion that the universe had a beginning and if so, what happened before that and then make it understandable to the layman. Needless to say he was successful and Errol Morris’ 1991 documentary of the same name soon followed. It also proved to be a hit. Morris makes his film as much about Hawking’s book as his life and to this end the filmmaker juxtaposes talking head interviews with friends and family with visual manifestations of the weighty ideas examined in the book. Not surprisingly, Hawking came from a highly intelligent family, but was the most normal one while his parents were regarded as eccentric. He wasn’t a particularly remarkable student, but his academics weren’t a good indication of his brilliance. As Hawking got older and made it into Oxford University, his brilliance and ability to think differently from everyone else became apparent. Academically, however, he was an underachiever. He did well enough, though, to go to graduate school at Cambridge University and was diagnosed with amyotrophic lateral sclerosis or Lou Gehrig’s disease. He was given two years to live. Fortunately, the diagnosis proved to be wrong, but he would soon lose control of his body and be forever confined to a wheelchair. 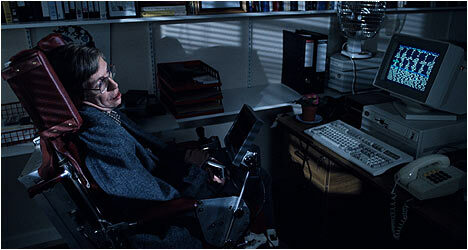 Hawking was intrigued by the origins of the universe and he decided to research galaxies and became an expert on particle theory and quantum mechanics. A Brief History of Time is a celebration of Hawking’s great mind and how he has been able to transcend his physical constraints. It also takes a fascinating look not only at the man, but his friends and family who share all kinds of anecdotes ranging from amusing to poignant. They all contribute to Morris’ masterful profile on Hawking and some of his key theories. The contrast and detail of this Blu-Ray transfer are quite good and really draw attention to some of the striking visuals from the documentary. There is an interview with director Errol Morris who talks about his approach to documentary filmmaking and how he applied it to A Brief History of Time. He talks about the origins of the project, which was offered to him by Steven Spielberg of all people! Morris wasn’t interested in making what he felt would be a thinly-disguised science lecture, but read Hawking’s book again and found a way to adapt it that interested him. There is also an interview with the film’s cinematographer John Bailey. He offers initial impressions of Morris and what it was like to work with him. Bailey talks about how they approached the visual aspects of the documentary, which was exploratory in nature and sympathetic towards its subject.